The Shadow of the Tomb Raider Ultimate Edition seems to be sold out in most major territories. Will there be restocks? There aren't any current plans to restock the Shadow of the Tomb Raider Ultimate Edition. However, we are evaluating if there is an opportunity to create a second run at a later date. Most of our PC fans prefer to digitally download their games, and as such, we don't traditionally create collector's editions for the platform. However, we are evaluating if there is an opportunity to release the physical Shadow of the Tomb Raider Ultimate Edition items as a separate purchase post-launch. After listening to our fans, we've decided to add the steelbook to the Shadow of the Tomb Raider Ultimate Edition for no extra cost. Are the DLC tombs with narrative elements tied to the main story? Will the main story finish completely on the game? After listening to feedback from our fans we decided to make tombs the focus of our season pass DLC. The narrative elements will fit within the world of Shadow of the Tomb Raider, but were created separate from the main story. Eidos Montreal is leading development of Shadow of the Tomb Raider, in collaboration with Crystal Dynamics. They have been part of the reboot since TR 2013, and know the world. This partnership has been in place for years, and we can’t wait for everyone to experience Shadow of the Tomb Raider. Shadow of the Tomb Raider will release on the Xbox One, Xbox One X, PlayStation 4, PlayStation 4 Pro, and PC September 14th, 2018. In order to deliver the best experience possible to fans, we focused our efforts on leveraging the most powerful consoles available. We’re currently focused on launching the game on Xbox One, PlayStation 4 and PC. We don’t have anything to announce for other platforms at this time. Yes, we’re very excited to be working with Nixxes on the PC version of Shadow of the Tomb Raider. 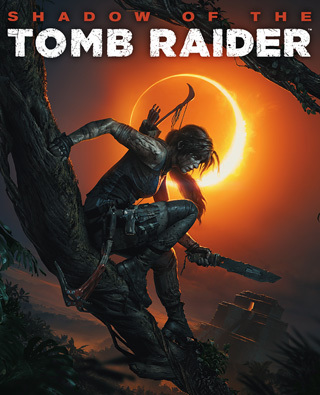 Fans who pre-order the Digital Deluxe, Croft Edition, or Ultimate Edition of Shadow of the Tomb Raider will gain 48 hours early access. There will be a voucher in-box for physical preorder purchasers that will enable them to download the relevant content 48 hours early. If you pre-order a digital version, the game will unlock two days early. Shadow of the Tomb Raider's official rating is currently pending, but we expect it to share the same rating as the previous two titles in the trilogy - M for Mature / PEGI-18. Both Camilla Luddington and Earl Baylon will return as voice and performance capture artists in Shadow of the Tomb Raider. We are very excited to have them return as Lara becomes the Tomb Raider. E3 2018 will feature world-premiere gameplay footage of Shadow of the Tomb Raider. We can't wait for you to see what the team at Eidos Montreal has been hard at work on! The events on our Maya-inspired calendar are the primary shows we'll be attending. That being said, the game will also be shown in territories around the world with our regional offices and distribution partners. We'll share more as that information becomes available! Lara is more driven and capable than ever before. She has lost loved ones, and will struggle to not become the enemy she fights. She’ll use guerrilla combat, cover herself in mud as camouflage, and employ fear tactics to defeat Trinity. All of this is set against the backdrop of a Maya apocalypse, and will define Lara as she becomes the Tomb Raider she is destined to be. Shadow of the Tomb Raider marks the end of Lara's origin story. The game is set against the backdrop of a Maya apocalypse, and will define Lara as she becomes the Tomb Raider she is destined to be. Eclipses are significant in many cultures, and also has significance to Lara's journey and defining moment. While Lara has grown immensely the past two games, this is the most driven and capable she's ever been. In Shadow of the Tomb Raider, Lara will become the Tomb Raider she is destined to be. The demo shown at the Shadow of the Tomb Raider reveal events takes place in Cozumel, Mexico. The remainder of the game will take place in the Amazon, more specifically, Peru. Shadow of the Tomb Raider takes place roughly one year after the events of Rise of the Tomb Raider. Our new story is handled by a writing team led by Jason Dozois and Jill Murray with input from Crystal Dynamics. Rhianna was instrumental in delivering Tomb Raider’s incredible story in the previous two games, and in shaping Lara’s voice. We’ve been able to build upon this successful foundation to deliver a narrative that will showcase Lara’s darkest hour, her fight to rise above this, and most importantly her defining moment as she becomes the Tomb Raider. Jonah returns as Lara's loyal friend to help her and he’s needed more than ever: At times he acts as a moral compass, other times he may question Lara’s motives. He’s always Lara’s friend, but this time you’ll see their friendship strained like never before. Sam and Reyes do not return in Shadow of the Tomb Raider. Jonah returns as Lara's loyal friend to help her and he’s needed more than ever: At times he acts as a moral compass, other times he may question Lara’s motives. He’s always Lara’s friend, but this time you’ll see their friendship strained like never before. respectful to the culture as possible. The trailer’s name is a play on words that represents Lara's growth as a character. This is her defining moment on the journey to becoming the Tomb Raider, and also the final chapter of her origin story. Why does Lara's hair look shorter in the Shadow of the Tomb Raider reveal trailer than in the game itself? In Shadow of the Tomb Raider Lara can truly become one with the jungle and use mud as a camouflage in order to instill fear in enemies to sow chaos. The Shadow of the Tomb Raider reveal trailer featured Lara swimming underwater. Is this an in-game mechanic? Yes, fan-favorite underwater exploration has returned in a deadly new setting. Players will also be able to fully explore underwater environments filled with crevasses, deep tunnel systems, and ancient artifacts. This underwater survival is about risk vs. reward: The further you explore, the more you can find, but these spaces are full of deadly creatures and you never know where the next pocket of air will be. In the Shadow of the Tomb Raider reveal trailer, Lara frightens a Trinity soldier into accidentally shooting a comrade. Is this an actual gameplay mechanic? Yes. As Lara becomes one with the jungle, she’ll use guerrilla combat, cover herself in mud as camouflage, and employ fear tactics to defeat Trinity. In the Shadow of the Tomb Raider reveal trailer, Lara uses a rope arrow to string a Trinity soldier up in a tree. Is this an in-game mechanic? Yes. Lara is more capable than ever before, and her climbing skills have advanced to the point that she is now able to wall run. These new game mechanics give the player more ways to explore the vast world, solve puzzles, while also increasing the challenge of traversal. In the Shadow of the Tomb Raider reveal trailer, Lara can climb on overhangs, is this an in-game mechanic? Yes. Lara is more capable than ever before, and her climbing skills have advanced to the point that she is now able to climb overhangs. These new game mechanics give the player more ways to explore the vast world, solve puzzles, while also increasing the challenge of traversal. There is a Jaguar in the Shadow of the Tomb Raider reveal trailer. Will they be featured in the game? Jaguars are the apex predator of the Amazon, and will be featured in Shadow of the Tomb Raider. Similar to Siberia's bears in Rise of the Tomb Raider, these jaguars act as guardians to the secrets within the jungle. Lara's journey is fueled by a drive that borders on obsession, and as such, she struggles to avoid becoming the enemy she fights in Shadow of the Tomb Raider. She questions what type of Tomb Raider she will become. In Shadow of the Tomb Raider Lara is more capable and driven than ever before, and this is reflected in her model. She is the strongest she has ever been, and prepared to do whatever it takes to defeat Trinity. Lara will keep many of her skills she earned through her previous adventures, to reflect her becoming a seasoned Tomb Raider. What does Lara's Shadow of the Tomb Raider outfit say about her? It looks more militant and as if she is more prepared. Lara is more prepared than ever at the start of Shadow of the Tomb Raider. She's brought the best survival gear along this time, and her outfit reflects the tactical mindset needed to keep her alive in such a brutal environment. This is the end of Lara's origin story. She is more capable and driven than ever before, and that drive borders on obsession. Lara, her friends, and at times even the player may question her motives, as she struggles to avoid becoming the enemy she fights. The narrative will redefine what it means to become a Tomb Raider. This doesn’t mean a dual pistol wielding, classic Lara, though it will represent the most driven and capable version of Lara Croft ever seen in the reboot. Shadow of the Tomb Raider is built using the Foundation engine as a basis. This is the same engine as Rise of the Tomb Raider, but it was dramatically enhanced by the Eidos Montreal R&D department, and pushed to its limit during game development. The Shadow of the Tomb Raider reveal press release mentions co-op play. What portion of the game will feature co-op? We have an excellent DLC plan for post launch, and that will include co-op. We’ll have more details on that at a later date. We constantly listen to what our fans are saying, as well as track what modes they play. As a result, there will not be competitive multiplayer in Shadow of the Tomb Raider. However, we will have details in the future on how we’ll extend the gameplay experience. Lara is more capable than ever before, and her new traversal skills include underwater exploration, rappelling, climbing overhangs, and wall running. New tools include the makeshift knife, and Lara will become one with the jungle and utilize fear in combat to take out Trinity as she rushes to stop the Maya Apocalypse.